5-day 4-night urban sketching with Susan Dorf in the magical streets of Patzcuaro, as they prepared for the annual Day of the Dead festivities! We sketched on a boat, we sketched in a convent. Very earthy! 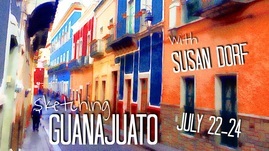 3-day 2-night urban sketching with Susan Dorf in the bold streets of Guanajuato! We marched around town with our art bags and improved our skills, with plenty of time for fun and exploration. Brilliant! 3-day 2-night monolith printmaking workshop in Guanajuato, Mexico with master printmaker Hugo Anaya. We explored the brilliant colors of this gem city and made beautiful art. C'mon get arty!